“I believe that everyone is meant to do something in this world, and mine was nursing,” Rami answered when we asked about her dreams and aspirations at 20. Rami, a senior in her mid-70s, who had just finished an intense Zumba workout at the Bayside Community Center, sat down with my group to share her life stories and experiences when she was at her prime age of twenty. 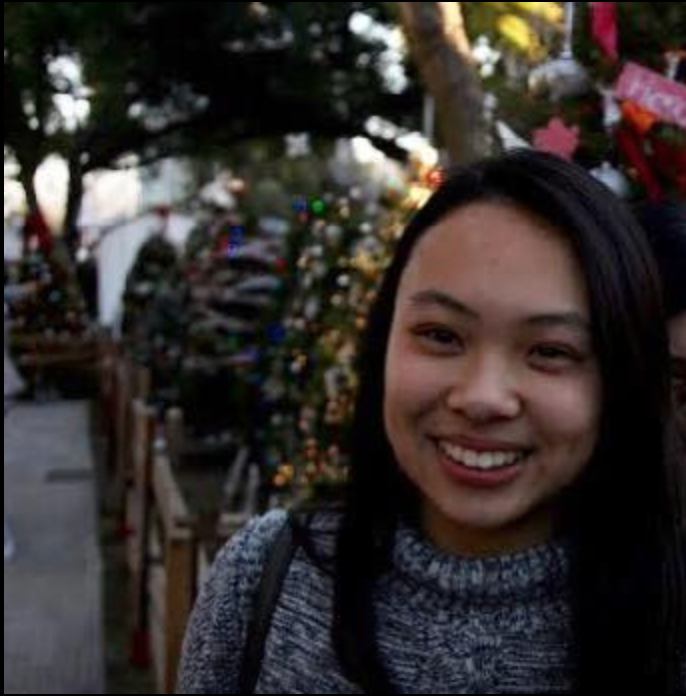 She explained that she was born and raised in the Philippines where everyone there had their eyes set on immigrating to the United States for a better life. It was her and her family’s dream to come to the US for better education, working conditions, and diverse opportunities. She eventually moved to California and was very focused on school in order to obtain the nursing degree she has always hoped to achieve. Despite long and arduous working hours as a nurse, she could not see herself in another profession. The reward of helping very sick and vulnerable patients, to taking care of them until they could walk out of the hospital door themselves gave her the greatest pleasure. She told us that she has not married, and has no children, which allowed her to live her young life stress-free. Her favorite hobby is to travel and experience the beautiful places that every country has to offer-- Australia and Japan were a couple of her favorites. The one thing that resonated most with me was that she emphasized that having a passion for whatever you do in life is what drives you and makes life meaningful. And I believe that this is so true. Reflecting upon our conversation, I really enjoy getting to spend time talking with seniors as they all hold so much wisdom and experiences that propelled them to where they are today. Though I’ve only met Rami for half an hour, I will always remember her passion that she holds for her nursing career, traveling, and maintaining friendships. On Saturday, we threw our second prom of the quarter at the West Center. We walked into the center through the bright red streamers and to a sea of seniors sitting by the tables with bright red tablecloths enjoying their pizza, churros, and juice. The atmosphere was so cheerful and lively, especially when the event director announced the Prom King and Queen. It warmed my heart to see the two dancing while everyone cheered them on. ​As we were passing out more food, people kept asking for seconds and thirds, and we even packed some to-go plates for them to take home. It was a busy time for us because the event could only go for one hour. By the end, we passed out the raffle prizes and goodie bags to everyone who joined us and many of them left with full hands. I am proud of everyone who worked so hard to put on this successful event because the food, prizes, decorations were all so amazing. I am also so proud that we could have this opportunity to put on so many smiles to these seniors’ faces! We presented our Neighborhood-friendly age assessment projects this past Wednesday and I thought it went pretty well! During our two site visits of Hillcrest, I learned so much about what the neighborhood had to offer to its citizens in terms of community centers and environment. Just by luck, we came across the Alzheimer's daycare center for seniors and the staff there were nice enough to let us in and talk about their programs and what they do there. We were also able to visit LeStat’s which is one of Hillcrest’s most famous coffee shops, and walk around the LGBTQ+ Center where everyone was so welcoming and friendly. It was nice to see so many programs supporting the underserved like FOG, a club for older gays to get together and have a good time. 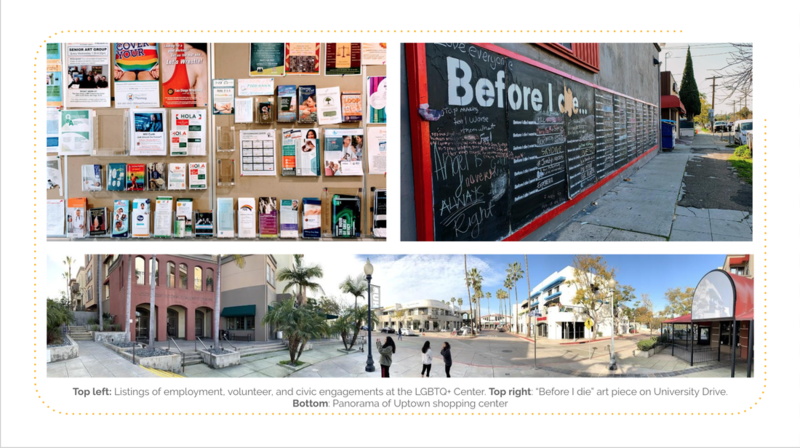 Researching about Hillcrest together with my group was such a meaningful experience because it allowed us to dive deeper and understand what it meant for a neighborhood to be age-friendly. ​Overall, this project was very meaningful to me because it changed the way I saw cities. I would find myself thinking about how clean the sidewalks were, how accessible the restaurants and stores were, or look for bus stops and benches with shade whenever I was outside. I would also pay attention to the housing options in each city I visit, and think about if they offer affordable housing. I realized I truly became a Life Course Scholar when I notice myself thinking about the WHO checklist whenever I walked along the street. On Tuesday Night, the Life Course Scholars put on a Rock n’ Roll themed Senior Prom at Casa de Manana. I was part of the set-up group so I arrived a little bit earlier to help put up decorations. It was cool because there was a photoshoot corner where we put up lights and decorations that matched the theme. It was awesome to see many seniors come in with the colorful shades and leis and encouraging each other to wear them too! The band rocked it with some interesting choice of music. The main vocalist had an interesting take to the song Havana which my classmates and some seniors danced on the main floor. 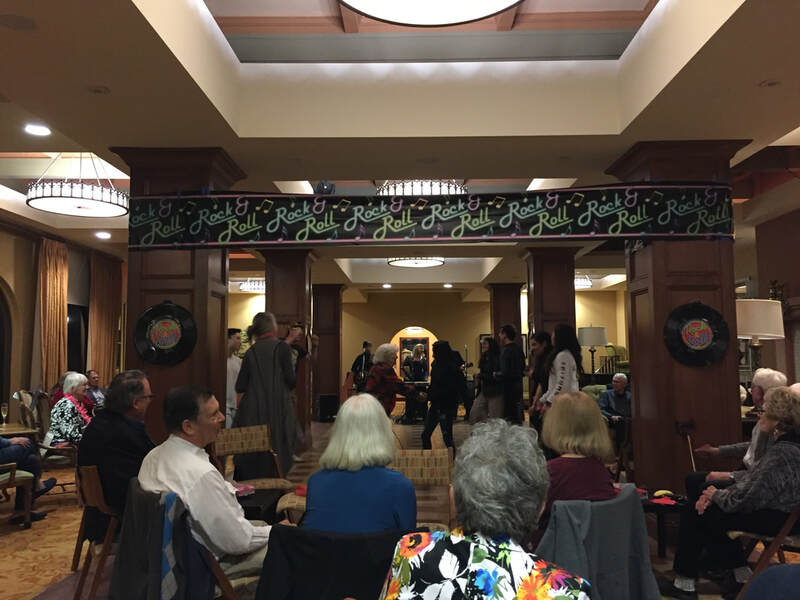 There were many seniors sitting back in the chairs chatting and eating desserts Casa offered, and some enthusiastic seniors dancing in the circle on the floor. It was kind of awkward for me at first because I wasn’t sure how to interact with the seniors but as I was handing out the desserts or the raffles to them, they were very welcoming and asked us our names and where we were from. As the music played and elders came trickling in as singles or couples, the energy rose and it was super interesting to me because I have never been part of an intergenerational event like this where people were either very old or very young. Listening to everyone present about their EPs was again, my favorite part of class. It was so valuable listening to my classmates passionately present their EPs stories because it gave us all a sense of what people of a generation or two generations before us have gone through. Whether they have immigrated from countries to the US, or went through many hardships to get to where they are today, all their stories and experiences can teach us valuable lessons we can carry throughout our lives and pass on to our next generation. I also really loved how my classmates’ personalized their memoir projects to their EPs stories. I really liked Victoria’s cookbook memoir where she put three different recipes after each stage of their parents’ love to represent a meaningful time they had together. I know that eating a certain food, made a specific way, can trigger immense memories. I also really liked Wayne’s dreamcatchers he made for his mom. It was so cool to hear how he wanted to represent his mother’s Native American background into handmade dreamcatchers which also have significance within his family. ​This Chair Rocks book group also presented today and hearing about ageism in our communities made me rethink about my own attitudes towards age and its stereotypes. We discussed examples of ageism in UCSD and it was really interesting because I rarely see older adults on campus besides older professors. UCSD has such a narrow band of age on campus and the campus is definitely not built for people with disabilities as it is so hilly. When I injured my leg last winter quarter and was bound on crutches, it was very difficult to get around this campus because it has so many stairs and dirt patches, so I can imagine it must be even more difficult for the elderly to get around this campus. We also discussed about how we are shocked at older people in class because we have a predetermined image of what an undergraduate student should look like. This discussion made me think about what other areas in La Jolla present unintentional or maybe intentional ageism, and how this community can expand to include a more age-inclusive population to enjoy all that La Jolla has to offer. This past Thursday Maria, Joey, and I took on the Tour of affordable housing for seniors together. Six out of the Seven homes we visited were located in Downtown San Diego. I thought that it was so interesting to see the stark contrasts of the architecture, facilities, and people just a few blocks from each other! We started off at Potiker Family Senior Residence. The infrastructure was very wheelchair accessible with large walkways and ramps with large outdoor dining areas as well as a well kept garden. It seemed like a safe, cozy, and comfortable place to live! The next location, Sara Frances Hometel, was completely different. There were only old men standing around at the entrance, many of them were smoking and physically disabled. The building is old, as the fence by the side of building had barbed wires on them. Maria and Joey got to tour one senior’s rooms and they noticed that it smelled really bad inside and the bedrooms were even smaller than our dorm rooms at UCSD. Celadon, just one street across is very modern. It was surprising to read that rent is $533-879, similar to the Hometel but living conditions seemed so much better. PATH San Diego’s Connections Housing is located three streets down. We noticed that the sidewalks were sloped, and the streets were busier with younger to middle aged adults whom were a mix of racial backgrounds. Next, Atmosphere located on Fourth Avenue was definitely not what we expected affordable housing to look like. It was highrise, modern, spacious, and clean. We thought that this place was probably more expensive to live in. Just a short walk away was New Palace Hotel which seemed older, but seemed like it was in the process of being remodeled. It’s is located near the highway but it was still away from the noise. We could only see one bus stop across the street, and some sidewalks, but no grocery shops. Our last stop was North Park Senior Apartments and I thought that this place was the most home-y out of all the homes we visited. It’s located in a suburban area with gyms and a floral store across the street. The most beautiful part though, was the roof floor where you could see all of San Diego. I felt like this home provided a very comfortable life for seniors because it supports a quiet and relaxing lifestyle. As a student at UCSD, I never got to explore downtown San Diego and North Park, but through this adventure, I got to dive in and immerse myself into the diversity of what is San Diego and observe what life is like for seniors. What I took away from this tour was that San Diego does offer a variety of housing options, however still at a steep price, especially for people living along the poverty line. 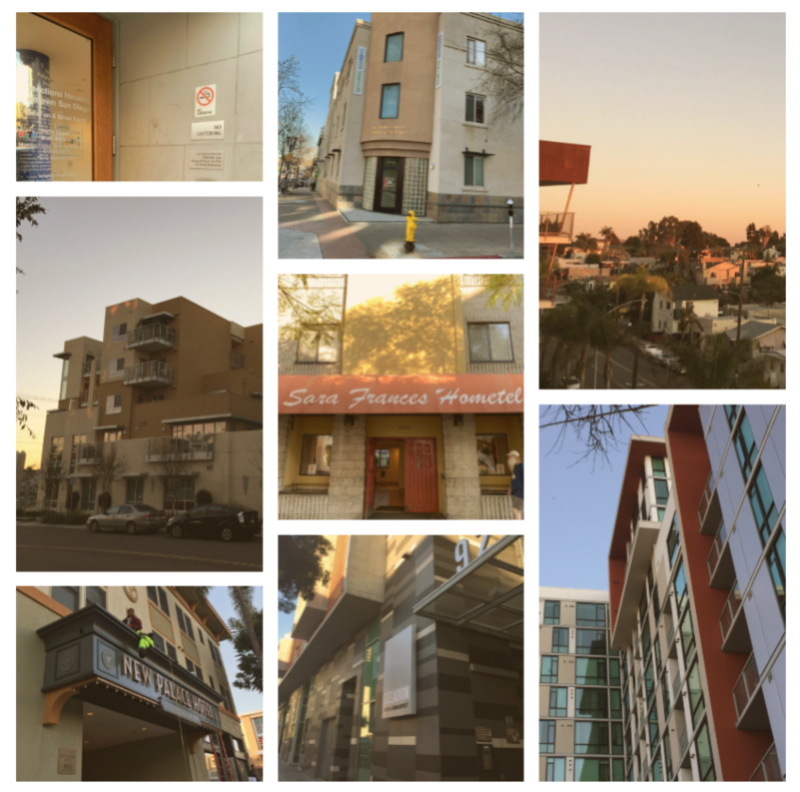 All in all, I am glad that PATH San Diego’s Connections Housing and North Park Senior Apartments serve as a national model for sustainable, affordable housing and I hope that more of these would be built in the future! On Wednesday, we had our first meeting on campus since Week 1. It was a jam-packed day with assignment check-ins and presentations. Elizabeth, Joey, and I prepared our Current Event Presentation and we talked about the risks and dilemmas surrounding elderly driving. We read that Prince Philip who is 97 years old was recklessly driving and got into a car accident, and it raised the question about how old is too old to drive? It became a discussion about how it’s important for the elderly to maintain independence for their social and mental health. But there is a point where they must be tested again for their ability to drive to maintain the safety of them and other people on the road. Other groups also presented about how memory care centers for elders were popping up throughout the United States to allow for caretakers to take a break. I think it’s important for elders to receive proper care, but we cannot forget about the health of caretakers as well. Another interesting article was presented about the differences of amount of social connection between elders between urban versus rural areas. Because it is hard to maintain a community center for elders in rural areas, how can we make sure that these elders are not feeling socially isolated? Ease of public transport use, support networks, and technology were all brought up to address this issue. ​During this class period, we also got to choose our groups and sites for NAPs. I’m particularly excited about this project because I have never really gotten to explore much of the San Diego counties except for Downtown or La Jolla and the places we have visited the previous weeks. Our group decided on visiting Hillcrest for this project because of the diversity of the population there and I’m really looking forward to our two site visits later these two weeks! Overlooking La Jolla Cove, the home of the San Diego seals, is a retirement home called Casa de Manana. As I was standing by the entrance, I noticed the old fashioned but sturdy architecture, the quiet and peaceful vibes, and the sights of the vast blue ocean right across the street. We had the fortunate opportunity to take a tour where Kelly and Betty provided many insights about what life is like at Casa de Manana. “I’ve raised nine children, went through two careers, and I came to Casa to spoil myself,” one senior shared. And I believe so. Casa offers activities nearly every other day, from visits to preschools, to concerts, to bingo nights, and visits to the park. They have a full gym equipped with personal trainers and nutritionists to keep them healthy. They have cooks for every meal of the day and daily cleaning services. They have Spanish, Latin, Oil painting, knitting, exercise, and many other classes to enrich their knowledge. 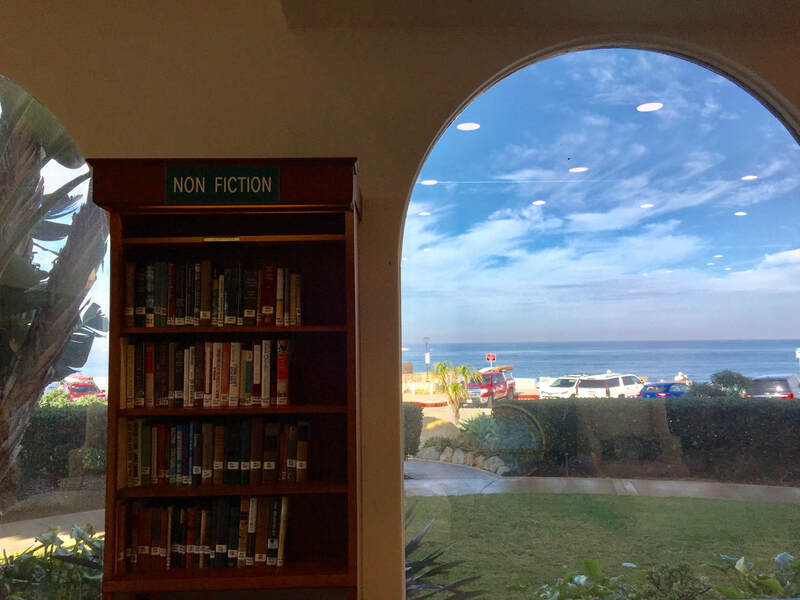 They even have a library with couches in front of a giant window directly facing the ocean. The seniors who shared their stories as well as other seniors whom we observed at their morning classes throughout the tour were all smiling and enjoying their time. Before visiting here, I had no idea this place existed and walking through the home honestly felt like a luxurious experience. ​I left Casa with mixed emotions. 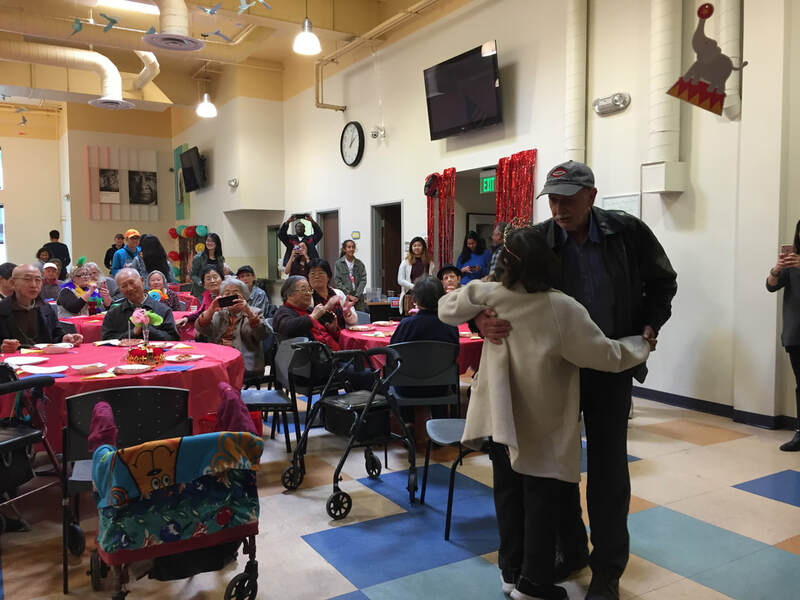 I am happy this place exists, and glad that so many seniors found Casa home, but contrasting this place with the senior center we visited last week shed light on just how different the life course of people from different socioeconomic classes can be.